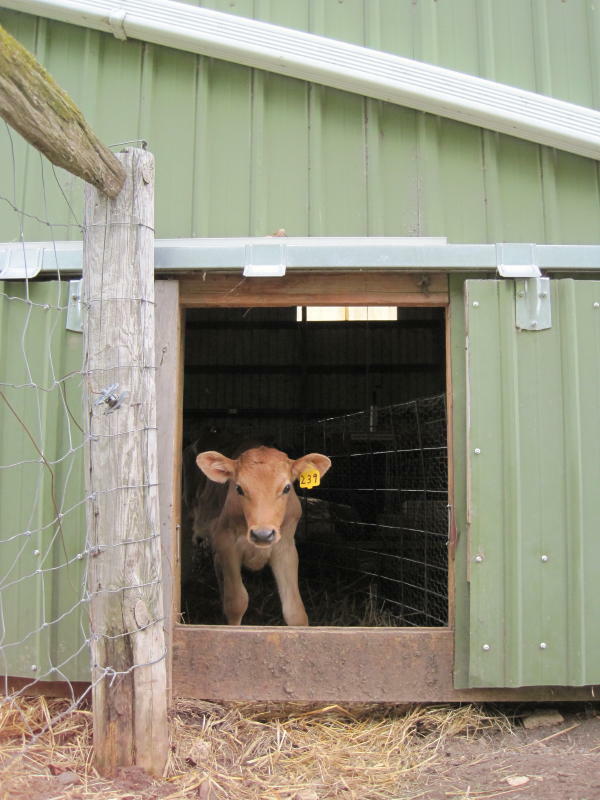 Fourteen new calves are settling in to life on the farm. They are joining us from two local organic dairy farms--one of which is just next door. We made two pens inside our poleshed, one for the older calves and one for the younger ones--two of them under 3 days old. They seem to enjoy being able to come and go through the animal-sized doors Rich cut into the side of the shed, and having the choice of a sunny or a shady spot for their afternoon nap. The older group is already grazing so well that we expanded their area to include more fresh pasture. It won't be long and the younger ones will be grazing too. In the meantime they are all enjoying the milk we are able to get from a neighboring dairy farm. We put buckets of fresh milk out for them to drink from this "milk bar" twice each day. Based on all the excitement I'd say milk is still their favorite food.